Perception is a powerful thing. So many of our actions are determined by how we perceive things to be. How we perceive is based on what we think we hear or see. Yet, our perception of events, words, and people can be entirely wrong. Looking back over my life, I realize during my youth and early Christian walk that my perception of many things were not accurate. Things that I thought were true proved otherwise. My spiritual perception has increased as my gradual growth in Jesus began. I have become aware of the lack of a spiritual gifts; mainly the gift of perception in almost all followers of the Lord. Hebrews 5:12-14, lets us know that spiritual maturity is linked to the way we use and/or exercise our discerning abilities. It comes about because we have learned to use our senses in a spiritual manner to discern both good and evil. Our desire today should be to have the ability (gift of discernment) to see beneath the outward form to the underlying, often hidden, reality. It is a necessary gift in dealing with people, understanding spiritual teaching and interpreting events. Perception is important for effective service, though is often lacking, even among God’s people. Mark 4:12 tells us, “That seeing they may see, and not perceive; and hearing they may hear, and not understand; lest at any time they should be converted, and their sins should be forgiven them.” Jesus is not speaking of natural ears or eyes but spiritual ears and eyes. You can’t perceive spiritual truth through physical natural means. In Acts 14:8-10, Paul sees the cripple man and perceived that he had faith to be healed. Your perception and discernment cannot be seen and if you can’t perceive a thing you will not have it. Romans 8:7 shows us that the natural mind cannot see the things of God it says “because the carnal mind is enmity against God, for it is not subject to the law of God, neither indeed can be”. The way you perceive things in your heart is the way your life will go. The Bible says it this way, “as a man thinks in his heart, so is he” (Proverbs 23:7). We are to “walk by faith and not by sight” (2 Cor. 5:7). Let God open the eyes of your heart today that your perception will be accurate and true. In turn, your life will be blessed and fulfilled. This also includes your finances. The tool we use to help our financial perception is financial planning. 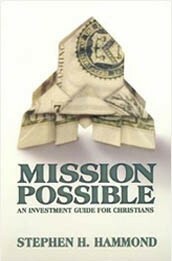 Without the proper financial plan, Christian can get caught up in a false perception of their life and lose touch with reality. They often engage in a mirage of financial denial. Creating a financial plan will show you the true picture. It will show you exactly where you stand.